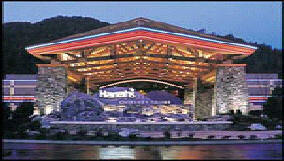 Yes, we have weekly trips to Harrah’s Cherokee Casino for only $45/person! Each trip, you receive a $15 gambling coupon from Harrah’s. Bring a friend & get $5 off your ticket. Joining Harrah’s Awards Programs offers many opportunities to earn FREE rooms (nationwide), new cars, & many other benefits. LEARN HOW TO EARN FREE BUS TRIPS! 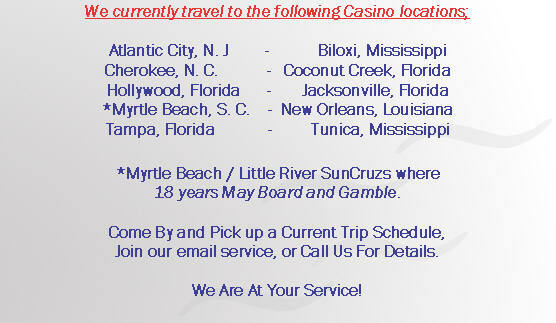 We specialize in Gambling Trips for groups of 7 – 22 passengers. Our Roundtrip Charter service actually will pay you for bringing others with you on a trip. More Passengers, More Savings for YOU! 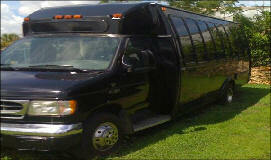 Each Trip offers many special offers and discount coupons. Want to make some money for yourself or a fundraiser? Plan your own trip. Pick a day and time when you would like to go. Ask Us!